The Cleveland Browns made a shocking roster cut Tuesday afternoon when they terminated the contract of defensive tackle Phil Taylor. Taylor was the first round pick of the Browns in the 2011 NFL Draft. He appeared in 44 of a possible 64 games during his four seasons with the team and had 109 tackles and 7 sacks but had numerous injury problems during his time in Cleveland. The release of Taylor means no players remain on the team from all the picks the Browns acquired when they traded the sixth overall selection in the 2011 NFL Draft to the Atlanta Falcons who selected Julio Jones. Jones this past weekend signed a five year extension with the Falcons and has been one of the best wide receivers in the National Football League. Meanwhile, the Browns acquired five draft picks and used them on players who are no longer on the roster. Let’s breakdown what potentially could be the worst trade in Cleveland sports history. While Julio Jones is making highlight worthy plays for the Falcons and Justin Houston is one of the best pass rushers in the NFL, Phil Taylor is now a free agent, Greg Little never lived up to the hype and was notorious for his dropping passes and now plays for the Cincinatti Bengals, Owen Marecic was a terrible fullback and was gone in two seasons and is currently out of the NFL. 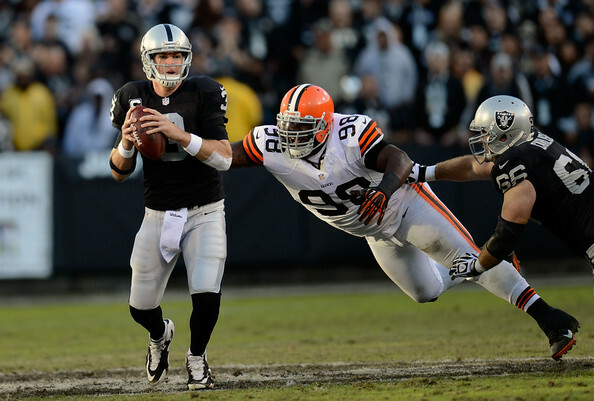 Brandon Weeden started 20 games for the Browns but never showed he was worthy of a first round pick. Holmgren and Heckert made a bold move making that trade and it continues to bite the Browns. It shows that you shouldn’t trade down and you should take the best player available no matter what.